Ana Moura, one of the most relevant Portuguese fado singer, will release her new album “Moura” (Universal Music) in November 27th. For that new project he conted with the special collaboration of Cuban diva Omara Portuondo. Both perform together the song “Eu Entrego” recorded in Los Angeles (EEUU). The album “Moura” has lyrics from Angola writer José Eduardo Agualusa and music from Toty Sa’Med. 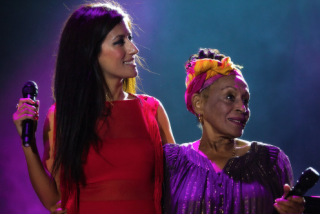 This is not the first time that they perform together, since Ana Moure joined the stage while to sing “Besame Mucho” with Omara while she was touring with the Orquesta Buena Vista Social Club® in Portugal.